According to a new survey carried out by the Azrieli Foundation and the Conference on Jewish Material Claims Against Germany, almost half of Canadians believe that the United States has a problem with Nazis. Huffington Post reported that 47% of Canadian respondents agreed that there is a “great deal of” or “many” neo-Nazis in the United States. By contrast, only 17% of Canadians believed there was a great deal of neo-Nazis living in Canada. It isn’t just Canadians that think the U.S. has a problem with neo-Nazis. 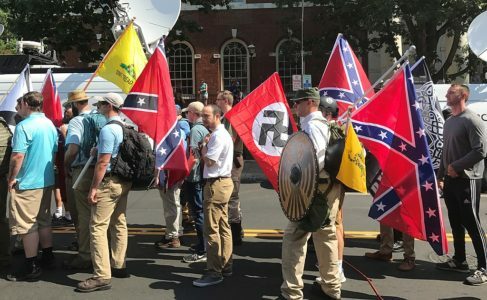 According to an earlier survey carried out amongst Americans, 51% of respondents thought there was a great deal of neo-Nazis living among them in the United States. Given that Americans re-elected Steve King just days after a bloody anti-Semitic attack on a Jewish synagogue in Pennsylvania, the survey’s findings will come as little surprise to many. The survey also revealed that Americans lack a strong fundamental knowledge of the Holocaust. 41% of Americans did not know what Auschwitz was. The figure rose to 66% among millennials. However, Canada’s Holocaust knowledge was not much better. 52% of Canadian millennials and 49% across all demographics could not name a single Nazi concentration camp. There are signs of improvement. Several states, including Oregon and Connecticut, have either tabled or signed bills requiring the inclusion of holocaust education in the local school curriculum.